10 August 2015 is National Lions Day! To celebrate The Yorkshire Wildlife Park has set up a foundation and today it launches. This is a major programme to help save lions in the wild. The charity is funding a three year £34,500 initiative at an African national reserve to protect the beautiful carnivores. Many of the funds donated came from the many helpful visitors at Yorkshire Wildlife Park by making donations after enjoying its magical walk through experience coming close to some of the world’s most astonishing and rare species, including a magnificent pride of lions rescued from a Romanian zoo. Thanks to the fundraising the Foundation has made the £11,500 a-year grant to the acclaimed international conservation organization Fauna & Flora International. 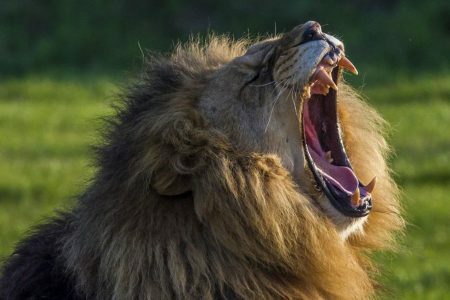 The landmark project – announced on World Lion day – will pay for a whole range of new measures, including the recruitment of rangers to track and monitor the lions. We are delighted to partner with Fauna & Flora International which shares our determination to create effective conservation project,” said Cheryl Williams, Foundation CEO. During World Lion Day visitors enjoy educational talks, a special feed from the bridge in Lion Country and the chance to support the Niassa Project by donating to the Foundation. Fauna & Flora is working on more than 140 projects in more than 40 countries. The YWP Foundation has built and international reputation for bold and powerful conservation initiatives around the world.